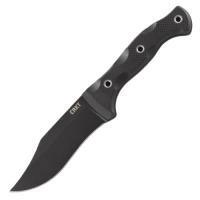 Columbia River 1520 1520 RAKKASAN Fixed Blade Knife FREE SHIPPING! The Columbia River 1520 Rakkasan fixed-blade tactical knife is part of their Forged by War program, designed by combat veteran Austin McGlaun. Its heavy-duty clip point blade has a wicked point and a long cutting edge, making it extremely effective for utility tasks and self-defense alike. It features a black powder coating that protects the steel against wear and also prevents reflections that might give you away when approaching your target stealthily. The handle is contoured to fit your hand comfortably, and its textured G-10 surface makes it easy to grip. It comes with a glass-reinforced nylon sheath with a carry clip for versatile portability. ©2002-2019 CopsPlus.com: Columbia River 1520 1520 RAKKASAN Fixed Blade Knife FREE SHIPPING!